Ballatt, Leicester John. 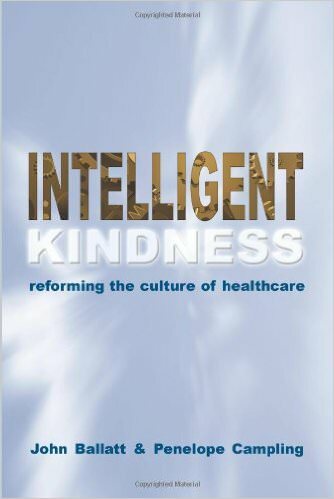 Intelligent Kindness: Reforming the Culture of Healthcare (RCPsych Publications, 2011). The NHS represents the last vestige of social inclusiveness and solidarity for frail, elderly people; for traumatised children; for people with intellectual disability, dementia, or severe mental health problems; and for people who repeatedly harm themselves, either directly, or persistently through the misuse of drugs and alcohol. And yet the staff who do the hard work of maintaining that solidarity are subject to a constant stream of criticism, efficiency savings, and instructions to do better. Exposed to precious little kindness themselves, they are nonetheless expected to provide it unstintingly. ''There is a lack of understanding, a lack of thoughtful connection-a lack of kindness in the way the organisation as a whole is treated''...The priority of everyone involved would be to ''help front line staff to help patients.'' Such a culture of kindness would play out in encouragement, support, and the celebration of achievements rather than the current obsession with condemnation and rooting out poor practice. Staff should be given the space and stature to take pride in their work, not forever feeling the dead hand of inspection and regulation. Bauer-Wu. 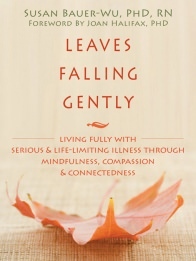 Leaves Falling Gently: Living Fully with Serious and Life-Limiting Illness through Mindfulness, Compassion, and Connectedness (New Harbinger Publications, 2011). A life-limiting illness may have taken hold of your body, but you can still live more fully and openly than ever before. You can enrich your life by exploring ways to make peace with yourself and deepen connections with friends and family. This book will help you reap the benefits of mindfulness and acceptance, one day at a time. Leaves Falling Gently is a comforting guide to the mindfulness and compassion practices that will help you embrace the present moment, despite your illness. With each simple practice, you’ll deepen your appreciation for the experiences that bring you joy and enhance your capacity for gratitude, generosity, and love. As you work through each personal reflection and guided meditation, you’ll regain the strength to live fully, regardless of the changes and challenges that come. Cassel, Eric. 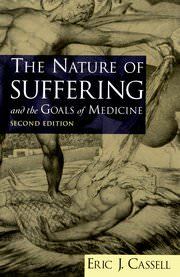 The Nature of Suffering and the Goals of Medicine (Oxford University Press; 2nd edition, 2004). This is a revised and expanded edtion of a classic in palliative medicine, originally published in 1991. With three added chapters and a new preface summarizing our progress in the area of pain management, this is a must-hve for those in palliative medicine and hospice care. The obligation of physicians to relieve human suffering stretches back into antiquity. But what exactly, is suffering? One patient with metastic cancer of the stomach, from which he knew he would shortly die, said he was not suffering. Another, someone who had been operated on for a mior problem--in little pain and not seemingly distressed--said that even coming into the hospital had been a source of pain and not suffering. With such varied responses to the problem of suffering, inevitable questions arise. Is it the doctor's responsibility to treat the disease or the patient? And what is the relationship between suffering and the goals of medicine? According to Dr. Eric Cassell, these are crucial questions, but unfortunately, have remained only queries void of adequate solutions. It is time for the sick person, Cassell believes, to be not merely an important concern for physicians but the central focus of medicine. With this in mind, Cassell argues for an understanding of what changes should be made in order to successfully treat the sick while alleviating suffering, and how to actually go about making these changes with the methods and training techniques firmly rooted in the doctor's relationship with the patient. Dr. Cassell offers an incisive critique of the approach of modern medicine. Drawing on a number of evocative patient narratives, he writes that the goal of medicine must be to treat an individual's suffering, and not just the disease. In addition, Cassell's thoughtful and incisive argument will appeal to psychologists and psychiatrists interested in the nature of pain and suffering. Gilbert, Paul. Mindful Compassion (Robinson Publishing, 2013). This title is based on the latest work from Professor Paul Gilbert OBE, bestselling author of "The Compassionate Mind", and "Buddhist expert Choden." Professor Gilbert has spent the past twenty years developing a new therapy called Compassion-Focused Therapy (CFT) which has an gained international following. In recent years, mindfulness is being used increasingly to treat common mental health problems such as depression, stress and stress-related insomnia. 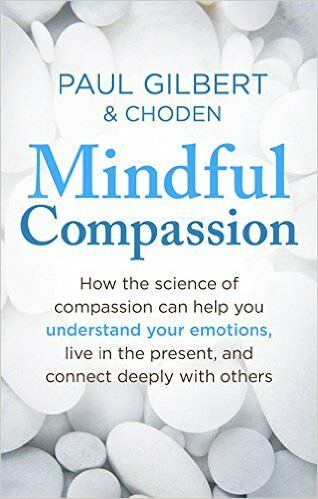 In this ground-breaking new book, Professor Gilbert, along with his co-author Choden, combines the best of Compassion-Focused Therapy with the most effective mindfulness techniques. The result is an extremely effective approach to overcoming everyday emotional and psychological problems and improving one's sense of wellbeing. Gilbert, Paul. Compassion Focused Therapy: Distinctive Features (CBT Distinctive Features) (Routledge, 2010). Research into the beneficial effect of developing compassion has advanced enormously in the last ten years, with the development of inner compassion being an important therapeutic focus and goal. 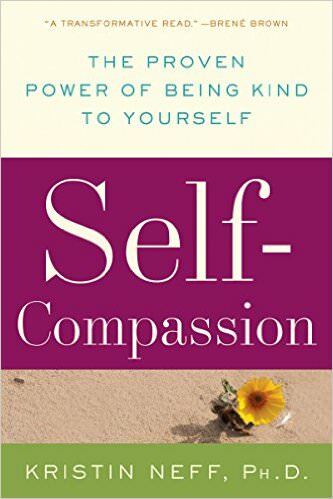 This book explains how Compassion Focused Therapy (CFT) – a process of developing compassion for the self and others to increase well-being and aid recovery – varies from other forms of Cognitive Behaviour Therapy. 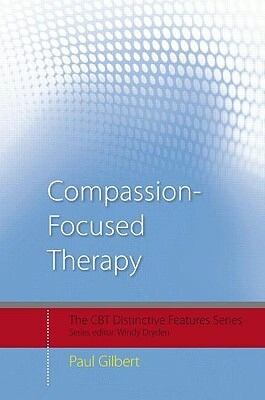 Comprising 30 key points this book explores the founding principles of CFT and outlines the detailed aspects of compassion in the CFT approach. Divided into two parts – Theory and Compassion Practice – this concise book provides a clear guide to the distinctive characteristics of CFT. Compassion Focused Therapy will be a valuable source for students and professionals in training as well as practising therapists who want to learn more about the distinctive features of CFT. Halifax, Roshi Joan. Being with Dying: Cultivating Compassion and Fearlessness in the Presence of Death (Shambhala Publications, 2011). The Buddhist approach to death can be of great benefit to people of all backgrounds—as has been demonstrated time and again in Joan Halifax’s decades of work with the dying and their caregivers. Inspired by traditional Buddhist teachings, her work is a source of wisdom for all those who are charged with a dying person’s care, facing their own death, or wishing to explore and contemplate the transformative power of the dying process. Her teachings affirm that we can open and contact our inner strength, and that we can help others who are suffering to do the same. Hanscom, David, MD. Back in Control (Veitus Press, 2013). In Back in Control, Dr. Hanscom focuses on an aspect of chronic pain that the medical world has largely overlooked: you must calm your nervous system in order to get better. 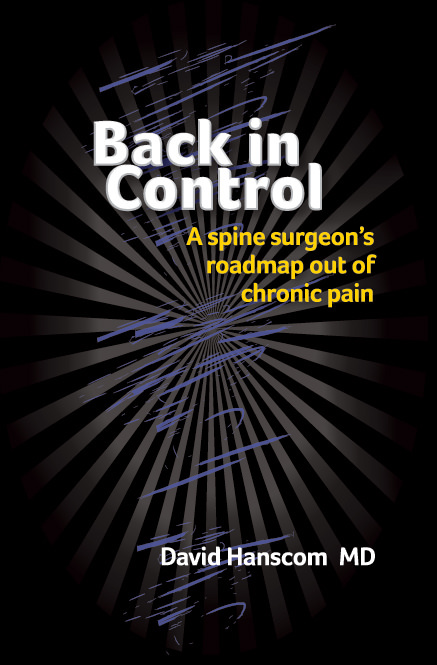 Beyond any other book about back pain, Back in Control reveals how to quiet a turbocharged central nervous system and make a full recovery. His life-changing sstem has helped hundreds of patients heal their pain. These patients’ stories, as well as his own, show that you can take charge of your care and set yourself on the road to a healthy, rich and full life. Dr. Hanscom is an orthopedic spine surgeon currently practicing at Swedish Hospital’s Neuroscience Specialists, Seattle, Washington. Hanson, Rick. Hardwiring Happiness (Harmony, 2013). Why is it easier to ruminate over hurt feelings than it is to bask in the warmth of being appreciated? Because your brain evolved to learn quickly from bad experiences but slowly from the good ones. Hardwiring Happiness lays out a simple method that uses the hidden power of everyday experiences to build new neural structures full of happiness, love, confidence, and peace. Dr. Hanson’s four steps build strengths into your brain— balancing its ancient negativity bias—making contentment and a powerful sense of resilience the new normal. In mere minutes each day, we can transform our brains into refuges and power centers of calm and happiness. Lewars, Corbin; Khamisa, Azim; Raab, Diana. 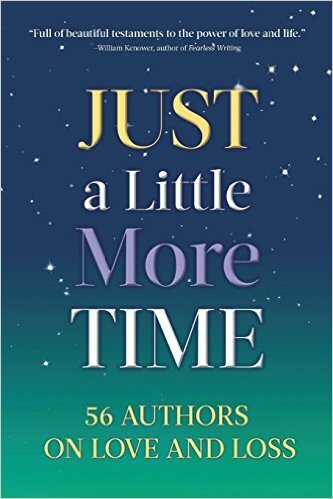 Just a Little More Time: 56 Authors on Love and Loss (Dane Chapin Ventures, 2017). Story is a crucial component of navigating the roller coaster that is grief. The beautifully written stories and poems in the Just a Little More Time anthology share tender last moments with loved ones, muse about what happens once we die, and most of all celebrate and delight with tales of love. The book's magic is hidden in the smallest details that underlie the universal message: that you can find hope after significant loss. Whether exploring the loss of a cherished forest or beloved wife, the love the authors capture is both fierce and tender. Their stories uplift and inspire the reader to think of loss in a new way--a blessing to have cared so much. Over fifty authors write about their experience of losing a sense of place, innocence, marriage, health, child, parent, or nature. The poems and essays are woven together to form an inspiring testament to the importance of being brave in love. Contributions vary from the humorous, to provocative, to poignant. Contributors include Azim Khamisa, author and founder of TKF, Nyaniso Tutu-Burris activist and granddaughter to Desmond Tutu, and poet Donna Hilbert. Sections include: Lost and Found, Gifts of Love, Nature, I Would Like to Say, Discoverable Truths, Always With Me, Last Moments, and Life After Life. Mayo Clinic. 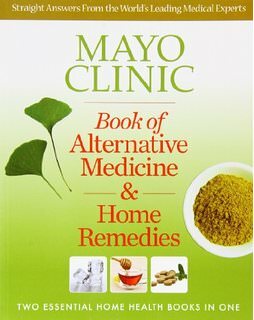 Mayo Clinic Book of Alternative Medicine (Oxmoor House, 2010). Neff, Kristin. Self-Compassion:Stop Beating Yourself Up and Leave Insecurity Behind (HarperCollins, 2011). The relentless pursuit of high self-esteem has become a virtual religion—and a tyrannical one at that. Our ultracompetitive culture tells us we need to be constantly above average to feel good about ourselves, but there is always someone more attractive, successful, or intelligent than we are. And even when we do manage to grab hold of high self-esteem for a brief moment, we can't seem to keep it. Our sense of self-worth goes up and down like a Ping-Pong ball, rising and falling in lockstep with our latest success or failure. Fortunately, there is an alternative to self-esteem that many experts believe is a better and more effective path to happiness: self-compassion. 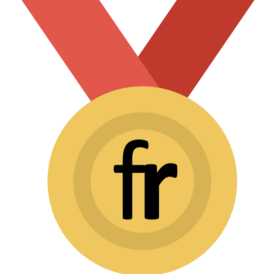 The research of Dr. Kristin Neff and other leading psychologists indicates that people who are compassionate toward their failings and imperfections experience greater well-being than those who repeatedly judge themselves. The feelings of security and self-worth provided by self-compassion are also highly stable, kicking in precisely when self-esteem falls down. This book powerfully demonstrates why it's so important to be self-compassionate and give yourself the same caring support you'd give to a good friend. This groundbreaking work will show you how to let go of debilitating self-criticism and finally learn to be kind to yourself. Using solid empirical research, personal stories, practical exercises, and humor, Dr. Neff—the world's foremost expert on self-compassion—explains how to heal destructive emotional patterns so that you can be healthier, happier, and more effective. Engaging, highly readable, and eminently accessible, this book has the power to change your life. Palmer, Parker. A Hidden Wholeness: The Journey Toward an Undivided Life (Jossey-Bass, 2009). 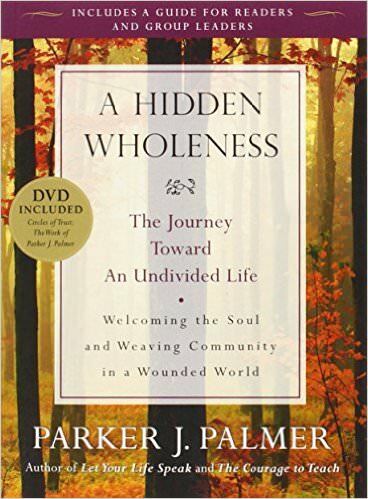 In A Hidden Wholeness, Parker Palmer reveals the same compassionate intelligence and informed heart that shaped his best-selling books Let Your Life Speak and The Courage to Teach. Here he speaks to our yearning to live undivided lives—lives that are congruent with our inner truth—in a world filled with the forces of fragmentation. A Hidden Wholeness weaves together four themes that its author has pursued for forty years: the shape of an integral life, the meaning of community, teaching and learning for transformation, and nonviolent social change. The hundreds of thousands of people who know Parker Palmer’s books will be glad to find the journey continued. Palmer, Parker. 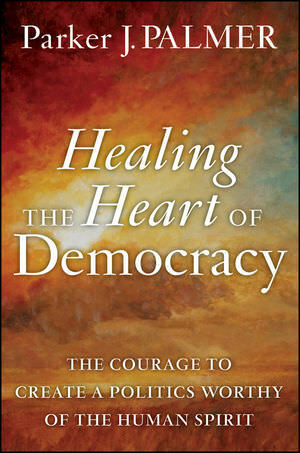 Healing the Heart of Democracy: The Courage to Create a Politics Worthy of the Human Spirit (Jossey-Bass, 2011). Pietroni, Patrick, MD. 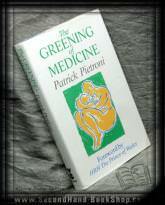 Greening of Medicine (Victor Gollancz, 1992). The 1990s heralded a new age of consciousness, an awareness of the importance of our relationships with the environment, with our fellow human beings and with our inner selves. The role of medicine, however, seemed to be developing in isolation from this mood. Dr. Pietroni cogently reappraises medicine's current thought. His controversial but hopeful message will be welcomed both by patiens and by those within the profession. Dr Pietroni questions medicine's current position and many of its conventions. He calls for an admission of the value of complementary medicine in the GP's surgery and a more collaborative approach to the doctor/patient relationship. Pigott, Judy and John W. Gibson. 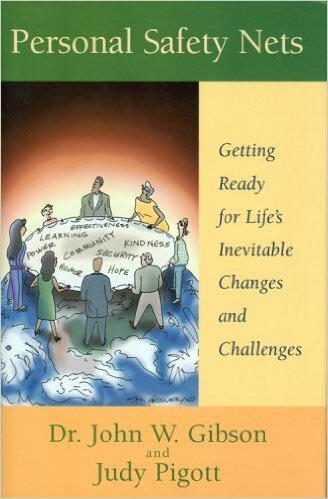 Personal Safety Nets: Getting Ready for Life’s Inevitable Changes and Challenges (Safety Nets Unlimited, 2007). There are times in life when we all need support. When you create your own personal safety net you put together in a useful way all the plans, systems, resources and people who will help. Using real life stories, examples and suggestions, this book will guide you in getting read for the changes and challenges - good and bad - that will inevitably come your way. Whether you're dealing with a child leaving home, military deployment, operating a family business, child birth, a medical emergency, living in place, elder care, a dysfunctional workplace, or hundreds of other challenges, the end result of having a "personal safety net" in place is a more safe, secure, and satisfying life. With your plans, resources and people identified and informed, your whole life is more secure and connected, replacing fear and isolation with security and community. Rinpoche, Sogyal. 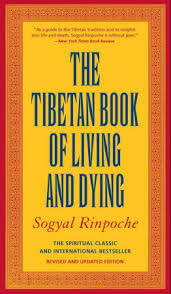 The Tibetan Book of Living and Dying (HarperCollins, 2009). This acclaimed spiritual masterpiece is widely regarded as one of the most complete and authoritative presentations of the Tibetan Buddhist teachings ever written. A manual for life and death and a magnificent source of sacred inspiration from the heart of the Tibetan tradition, The Tibetan Book of Living and Dying provides a lucid and inspiring introduction to the practice of meditation, to the nature of mind, to karma and rebirth, to compassionate love and care for the dying, and to the trials and rewards of the spiritual path. Buddhist meditation master and international teacher Sogyal Rinpoche brings together the ancient wisdom of Tibet with modern research on death and dying and the nature of the universe. With unprecedented scope, The Tibetan Book of Living and Dying clarifies the majestic vision of life and death that underlies the classic sacred text The Tibetan Book of the Dead. Sogyal Rinpoche presents simple yet powerful practices from the heart of the Tibetan tradition that anyone, whatever their religion or background, can do to transform their lives, prepare for death, and help the dying. Sextou, Persephone. Theatre for Children in Hospital. The Gift of Compassion (Intellect, December 2016). Recent decades have seen a new appreciation develop for Applied Theatre and the role of art in arts-based activities in healthcare. This book looks specifically at the place of theatre for children who are hospitalized, showing how powerfully it can enhance their social and mental well-being. Child-led performances, for example, can be used as a technique to distract young patients from hospitalization, prepare them for painful procedures, and teach them calming techniques to control their own pre- or post-operative stress. 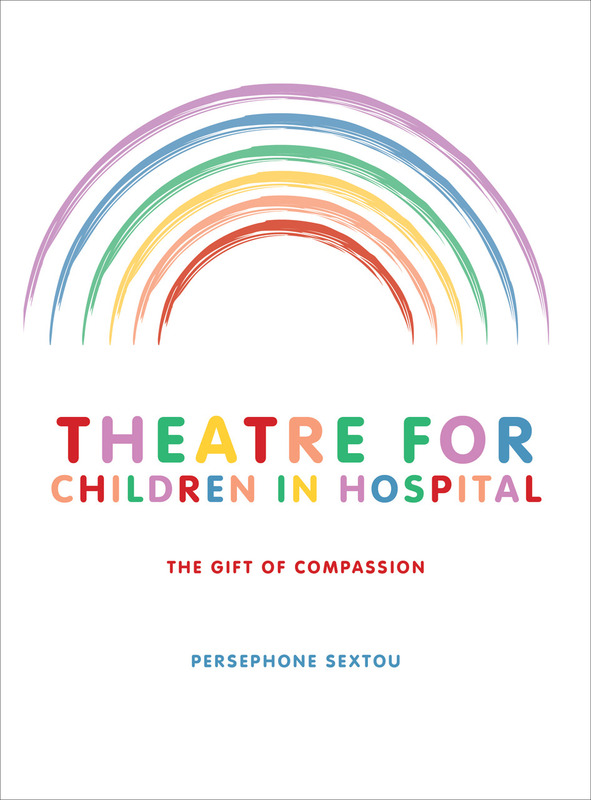 Persephone Sextou details the key theoretical contexts and practical features of theatre for, children, in the process offering motivation, guidance and inspiration for practitioners who want to incorporate performance into their treatment regimen. Siegel, Dr. Bernie. 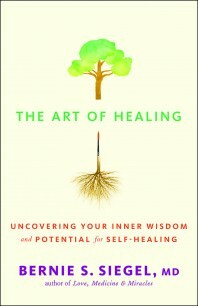 The Art of Healing: Uncovering Your Inner Wisdom and Potential for Self-Healing (New World Library, 2013). In 1979, Dr. Bernie S. Siegel, a successful surgeon, took a class from Elisabeth Kübler-Ross that focused on crayon drawing for healing, especially with patients facing life-threatening disease. Siegel incorporated into his practice these techniques — many of which were laughed at by others in the medical community. But his Exceptional Cancer Patients “carefrontation” protocol facilitated healings, often deemed miraculous, and attracted attention. “Dr. Bernie” discovered and shared the fact that while patients might need antibiotics, surgery, radiation, and chemotherapy, their bodies also want to heal. He found that this innate propensity could be aided by unconventional practices, including drawing. Why? Drawing produces symbols often representing the subconscious. Siegel shows how to interpret drawings to help with everything from understanding why we are sick to making treatment decisions and communicating with loved ones. All those facing ill health, and those caring for them, personally and professionally, will welcome the hands-on, patient-proven practices offered here. Phyllis Ann Solari-Twadell, PhD, RN, MPA, FAAN and Mary Ann McDermott, EdD, RN, FAAN. Parish Nursing: Development, Education, and Administration (Mosby, 2006). Editors are pioneers and experts in parish nursing, resulting in cutting-edge knowledge balanced with historical perspective. Provides information on how to develop and administer a parish nursing program, focusing on the responsibilities of a parish nursing coordinator at the congregational level. Discusses the educational preparation necessary for parish nurses. Presents the role development and core functions of parish nurses. The latest information and research on parish nursing and pastoral care. Integration of religion, spirituality, and health that transcends the boundaries of specific denominations. Addresses core interventions used by parish nurses in the context of the standardized languages of NANDA, NIC, and NOC. Sood, Amit, MD MSC. 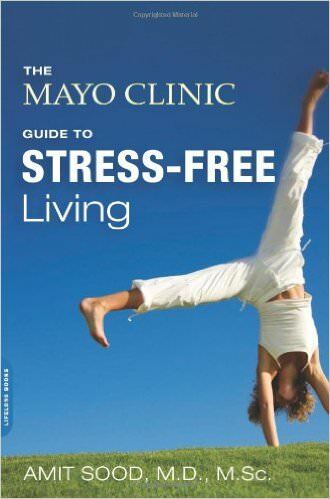 The Mayo Clinic Guide to Stress Free Living (Da Capo Lifelong Books, 2013). Have you ever driven several miles without noticing anything on the road, or read a page in a book without registering any of it? Do the day’s worries and disappointments crowd your mind as you’re trying to fall asleep at night? Do you feel stressed much of the time and aren’t sure how to find peace? In this book, Amit Sood, M.D., M.Sc., a Mayo Clinic specialist in stress and resiliency, reveals how the mind’s instinctive restlessness and shortsightedness generate stress and anxiety and presents strategies for living a more peaceful life. The book is based on the highly popular stress management program offered at Mayo Clinic that Dr. Sood developed after two decades of work with tens of thousands of people. "Dr. Sood has put together a simple, secular and structured program that is anchored in science, is free of rituals and dogmas, and is accessible to everyone. Youngson, Robin. Time to Care: How to Love Your Patients and Your Job (Create Space Independent Publishing Platform, 2012). In today’s beleaguered healthcare system, burdened with epidemic levels of stress, depression and burnout, TIME to CARE offers health professionals the opportunity of renewal. Here are the secrets to building a happy and fulfilling practice, wellbeing and resilience. Youngson bravely relates his own transition, from a detached clinician to a champion for humane whole-patient care; at times poignant, sometimes funny but always brutally honest. TIME to CARE offers a deeply compassionate and insightful account of a health system that is failing both patients and practitioners all over the world. But there’s more…. Drawing on advances in neuroscience and positive psychology, and tapping the power of appreciative inquiry, Youngson conveys in clear and simple language how health workers can strengthen their hearts, learn the skills of compassionate caring, and rise above institutional limitations to transform patient care…. and rediscover their vocation. 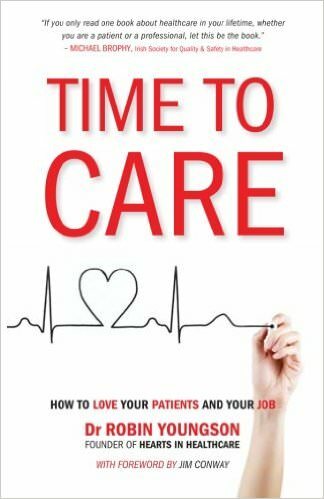 Tipped to become an international best-seller, TIME to CARE is recommended reading for today’s health professionals, students, health leaders, patients, and all those passionate about re-humanizing healthcare.